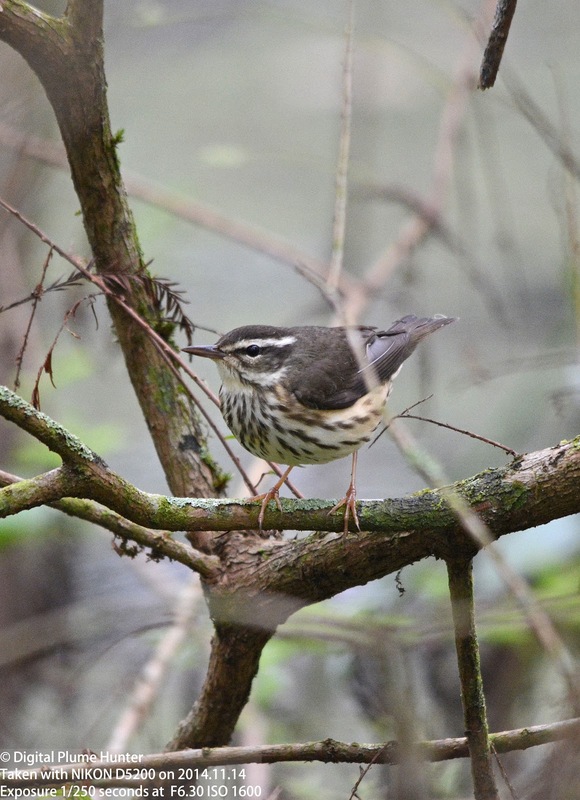 Anyone from the Old World would surely be forgiven for harboring a tinge of birding envy for the avian taxa that we in North America hold exclusive to our area. 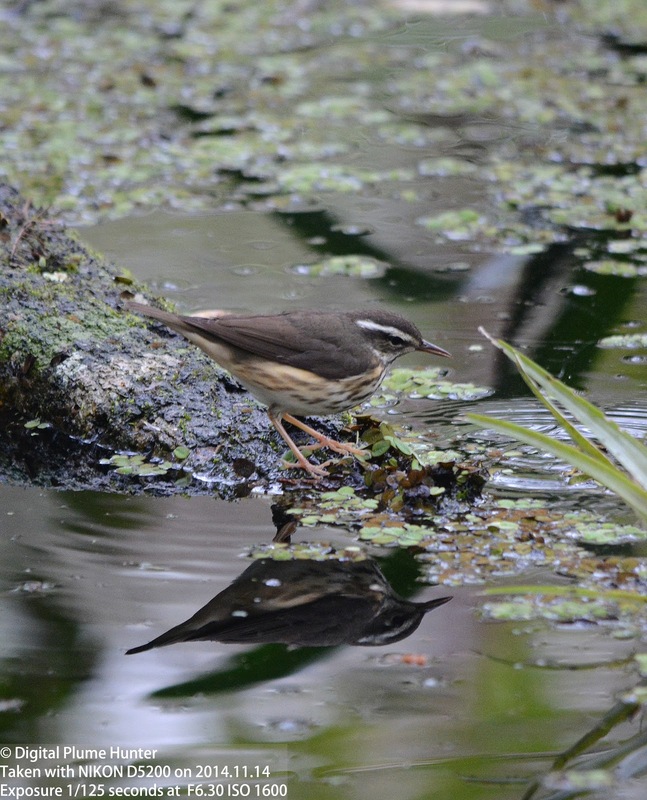 Familiar as birders are, on both sides of the "pond", with such cosmopolitan families as herons, storks, cranes, ducks, doves, hawks, pipits, jays, and kingfishers, it is nonetheless a fact of human nature to desire most what we most lack. 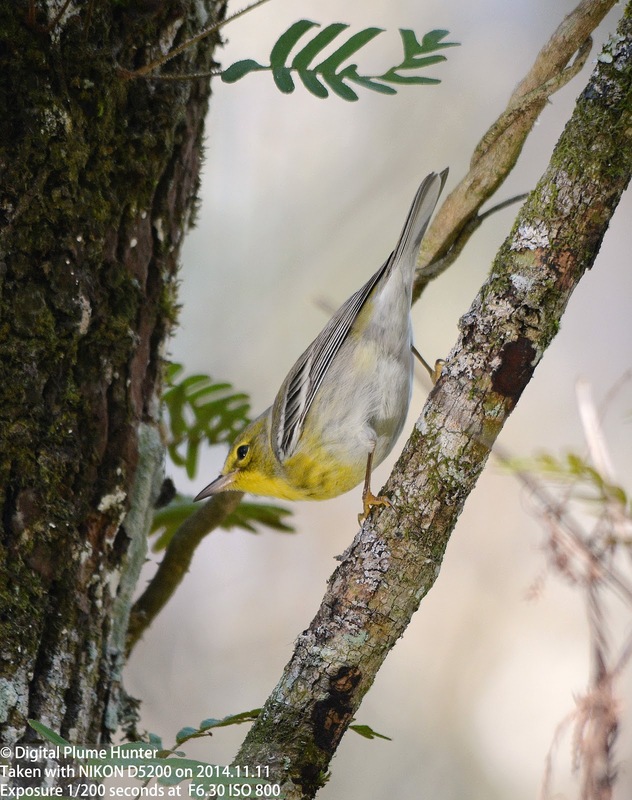 Small wonder then, and illustrative of this peculiar affliction, is the fact that bird families such as Wood Warblers, become highly prized attractions to visiting birders owing in no small part to the fact that the Old World is wholly bereft of their spectacular presence. 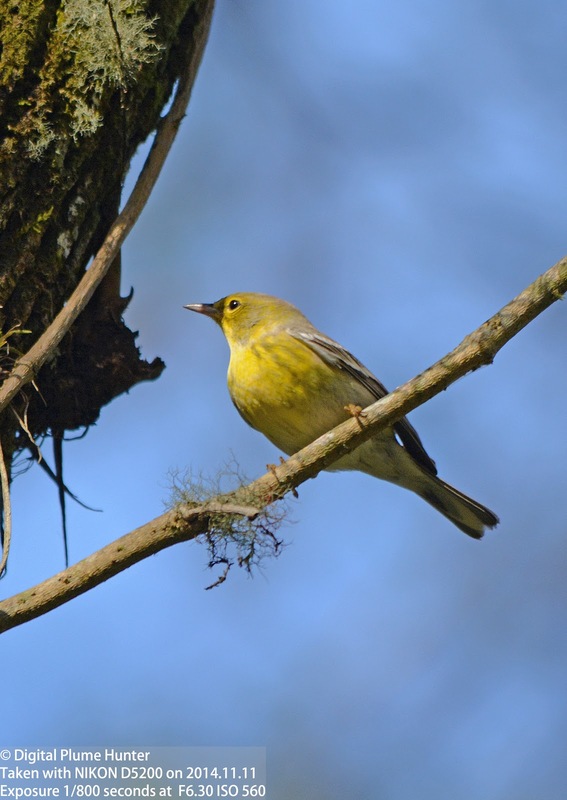 We start with the New World Blackbirds aka the Icteridae, a family known for Meadowlarks, Grackles, Blackbirds, Cowbirds and Orioles; here, represented very ably by the Baltimore Oriole in black and golden-orange plumage. 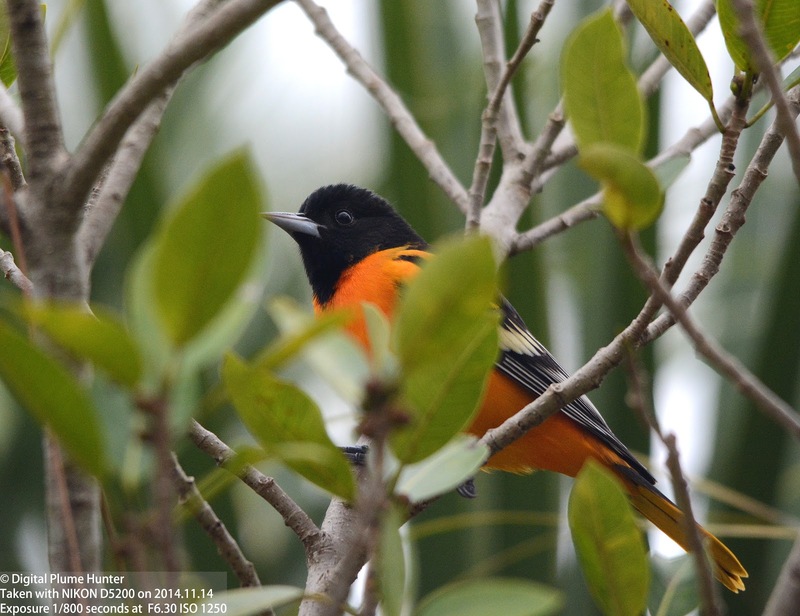 Unlike the other Oriole species we are familiar with (eg., Bullock's, Hooded, Scott's and Orchard) that migrate to the neotropics in the Winter, the Baltimore Oriole is rare example of an oriole that will deign to over-winter in the US -- but only in the temperate conditions of South Florida. 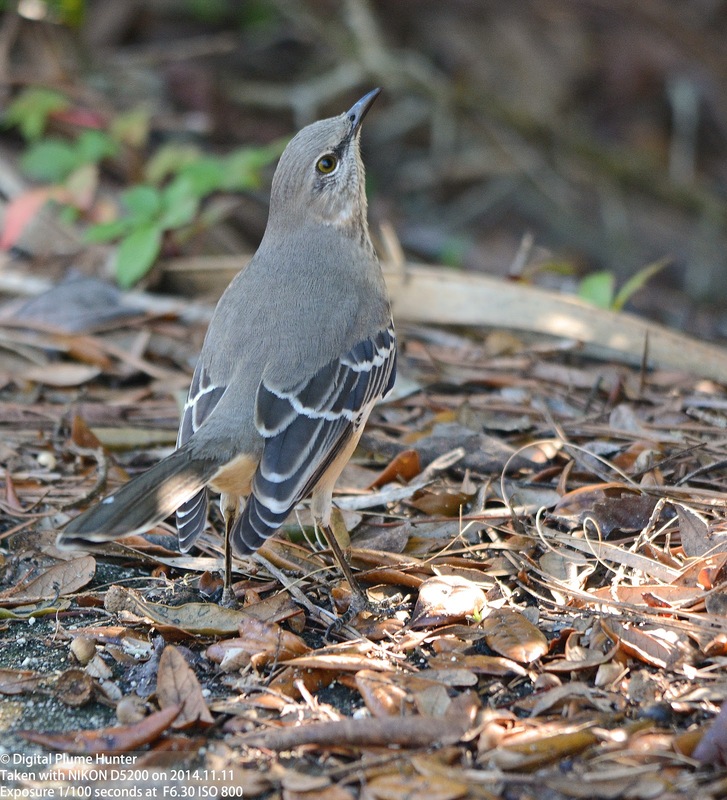 Next, a Mimid: the Northern Mockingbird belongs to the New World family of Mimidae which includes Mockingbirds, Thrashers and Catbirds. 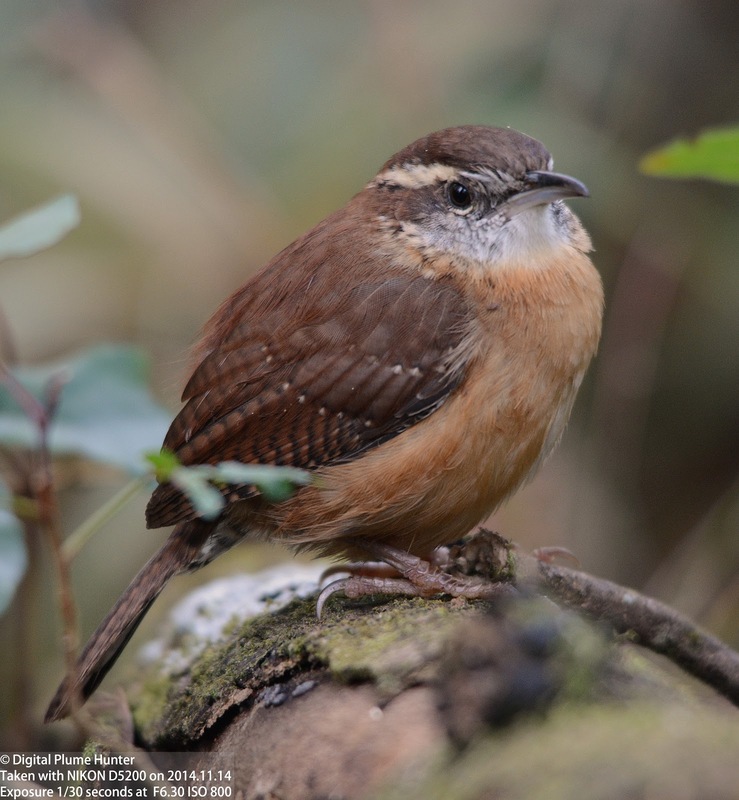 As the name Mimid suggests, species in these families are excellent mimics. 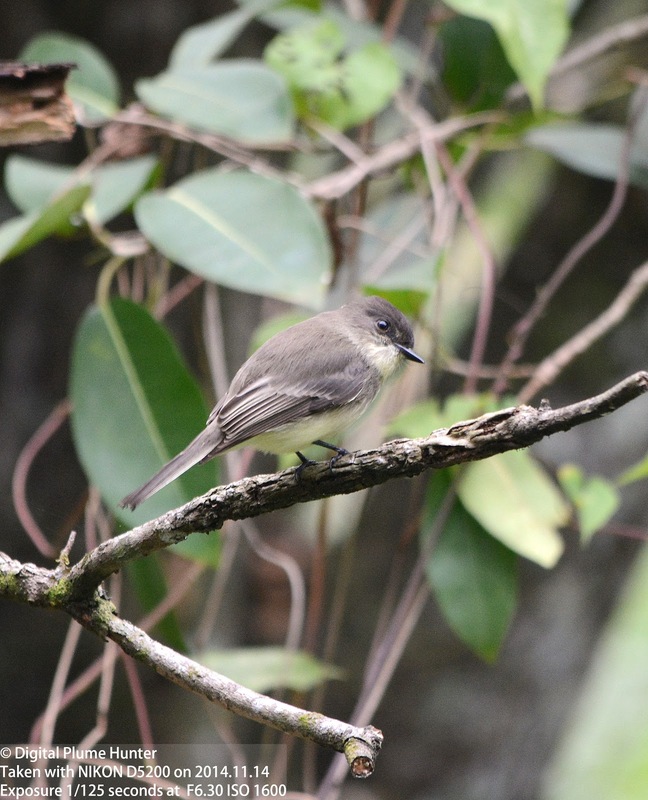 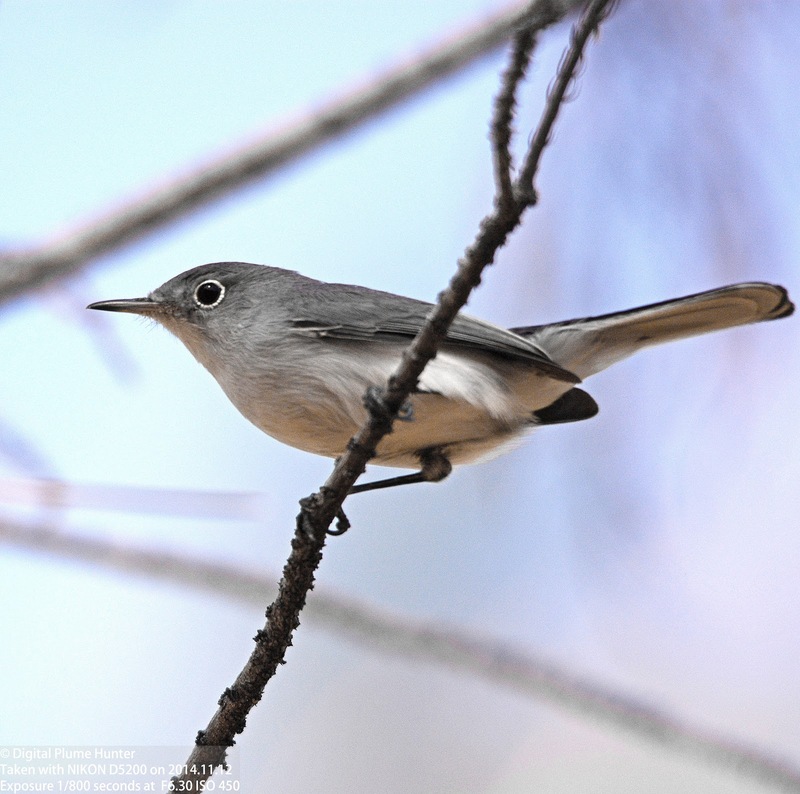 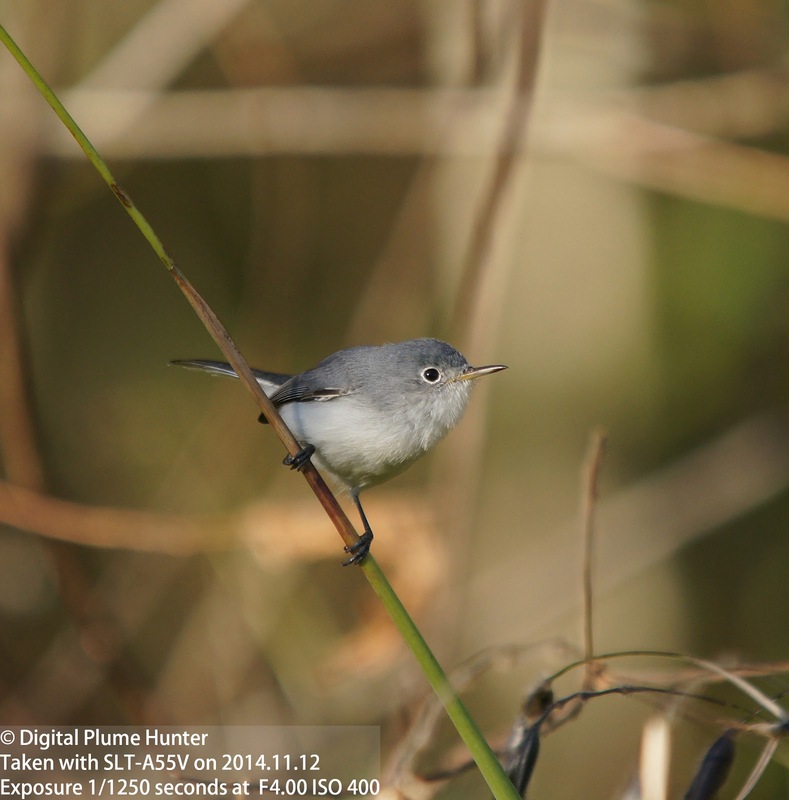 Compared to mimids, Gnatcatchers are positively tiny -- however, just like the Mockingbird, they are exclusive to the Americas. 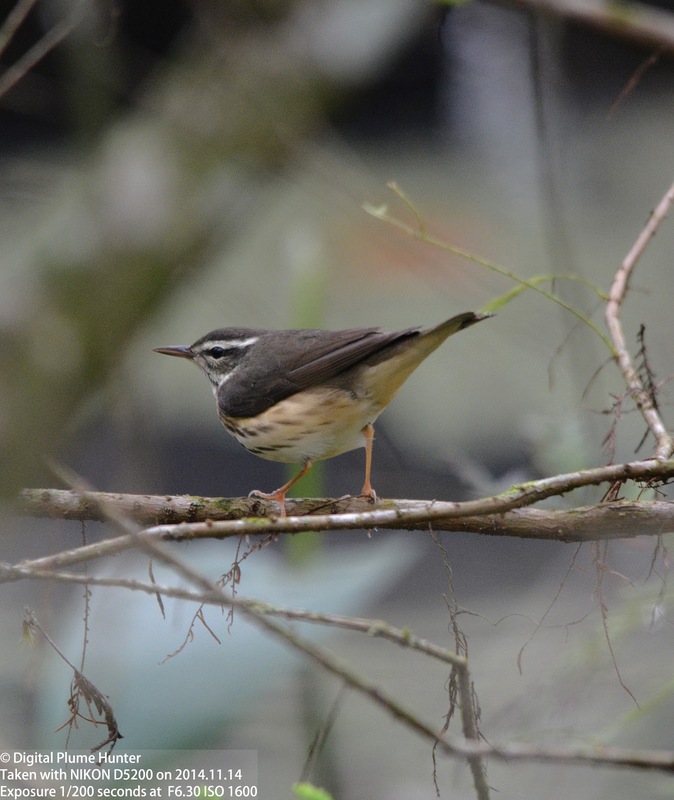 Vireos are also exclusively American but new research threatens that understanding -- suggesting provocatively that the Shrike-Babblers of Asia, long placed in Timaliidae (the Babbler family), should warrant reclassification as Vireos. 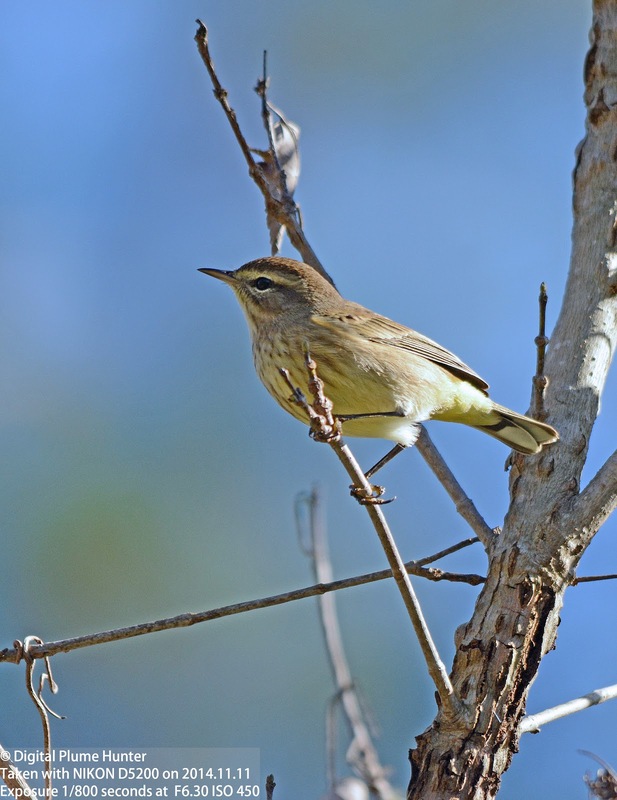 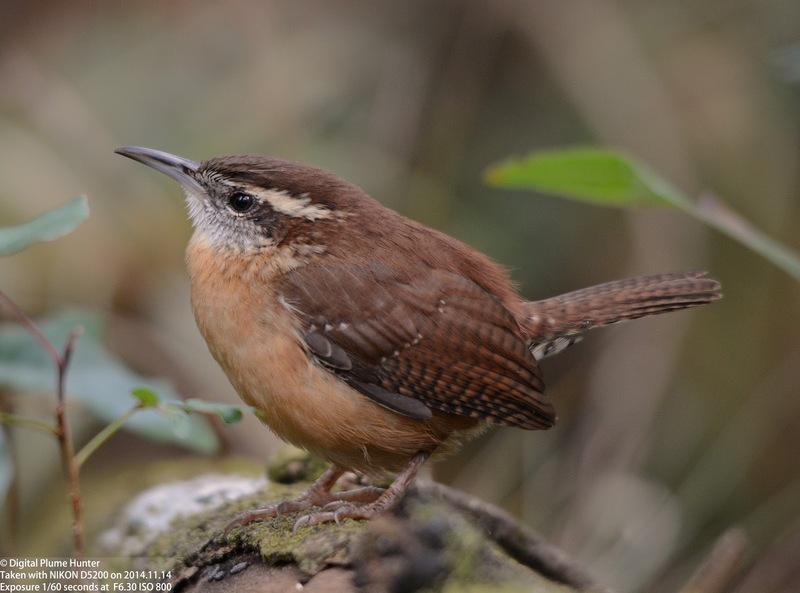 Indeed, Shrike Babblers do share some common characteristics with our very own Vireos -- such as the monotonous song that they repeat continuously (Red-eyed Vireo come to mind, anyone?). 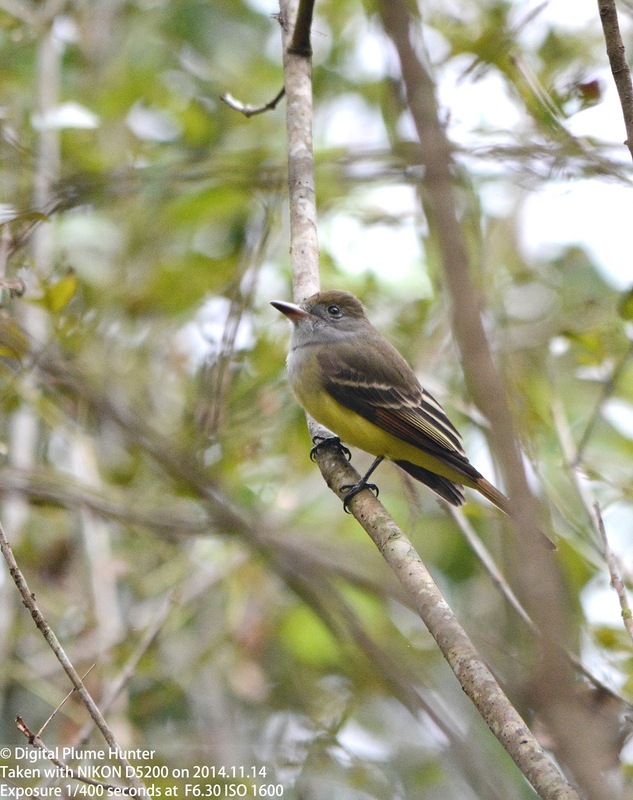 Tyrant Flycatchers are a large family of over 400 species (the largest in the Avian Taxonomy) of insectivorous songbirds ranging in size from 2.5" to 16" and found from the Southern tip of Argentina to the high Arctic habitats of Canada (see here for additional Tyrant species observed in SE Arizona). 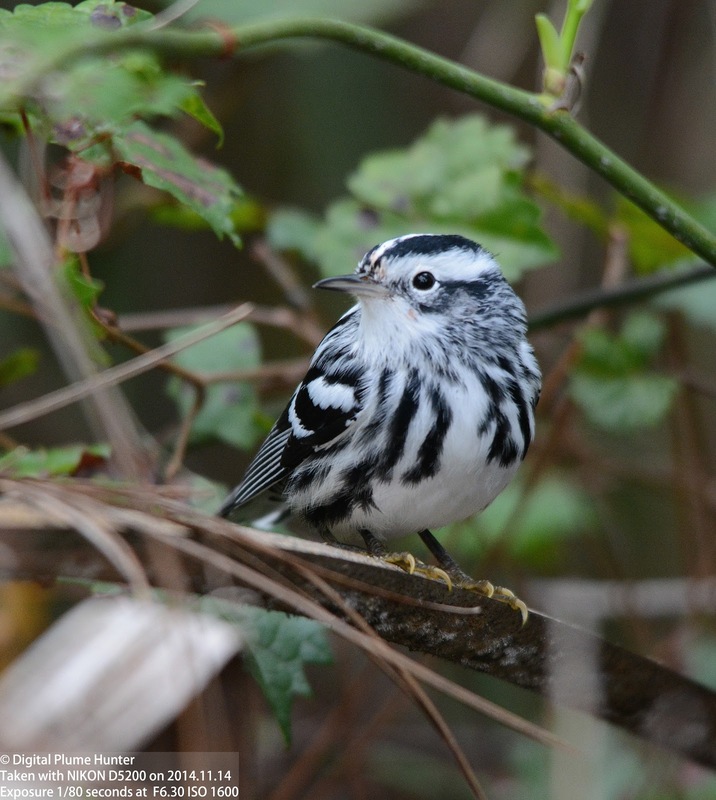 Thus, as this eclectic collection attests, caution is warranted when we talk of Orioles, Warblers, Sparrows, and Blackbirds as global families -- although unambiguous in geographical context, they refer to completely different avian taxa that, while sharing many characteristics due to convergent evolution, are otherwise unrelated and found in discontinuous ecozones. 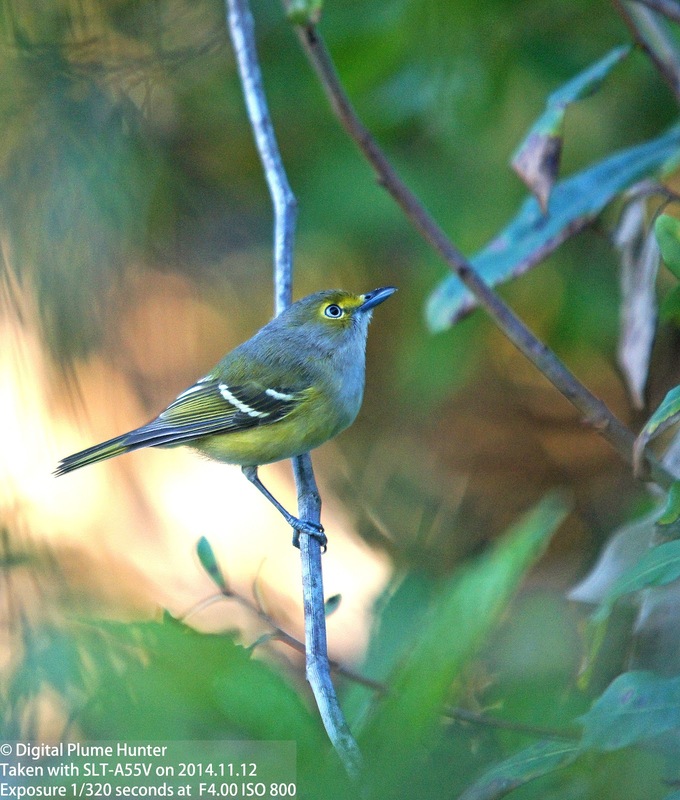 Conversely, as molecular studies advance, we learn that families, previously considered uniquely American, such as the Vireos, do indeed have representation in the Old World. 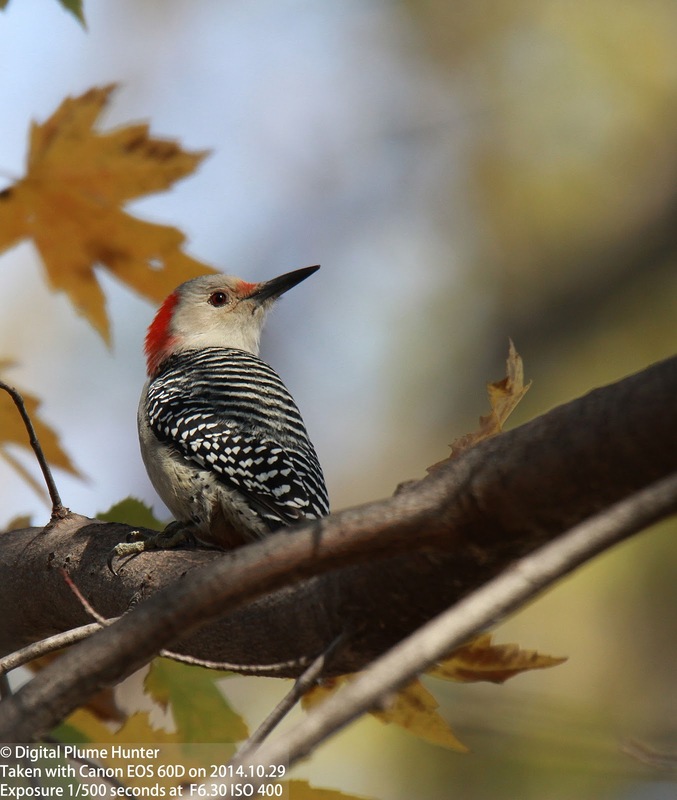 While everyone has heard of John James Audubon, it may be a surprise to some that Audubon is not considered to be the father of American Ornithology (that honor surely belongs to Alexander Wilson), but, what isn't disputable is that Audubon is most assuredly the foremost American master of bird art -- and hence, by consequence, singularly responsible for inspiring millions of people to delve into the fascinating subjects of the avian world through his exceptional imagery and vivid picturization of American birdlife. 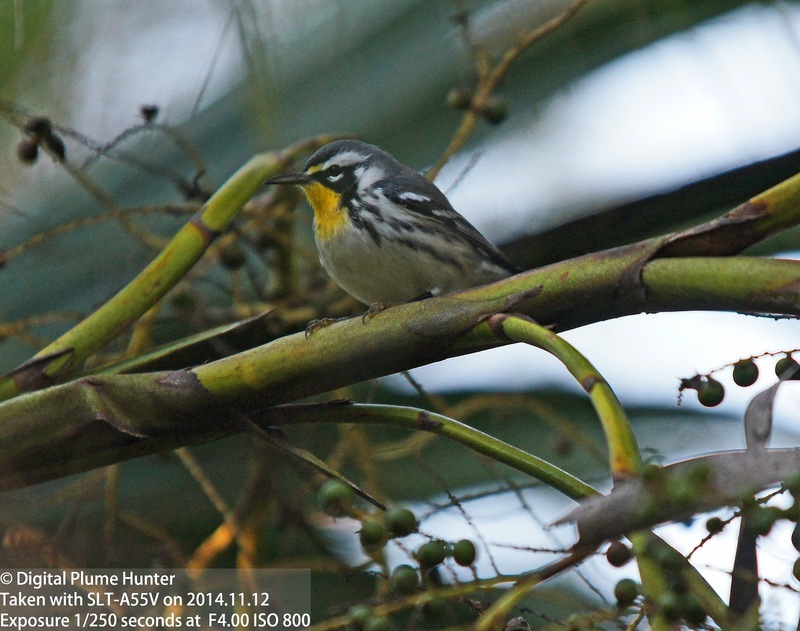 This blog, in turn, is humbly inspired by the traditions of Audubon -- in documenting the visual brilliance of our Avifauna -- and by Wilson -- in exploring avian science and the issues that affect bird conservation. 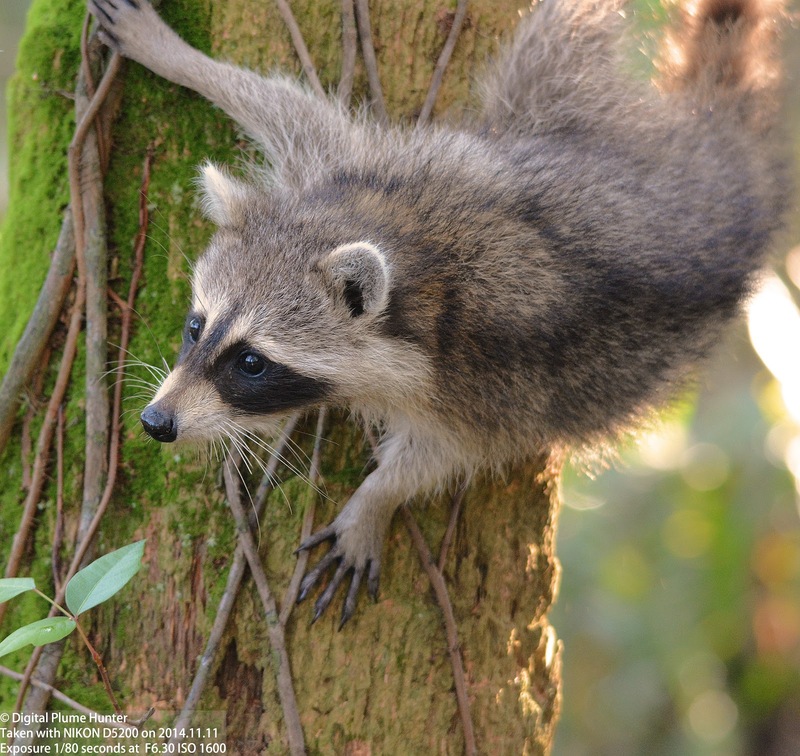 Both endeavors in which this blogger is engaged in sincere pursuit though with full knowledge of the resulting shortcomings that must inevitably accrue from aspiring to their high, perhaps even unattainable, standards. 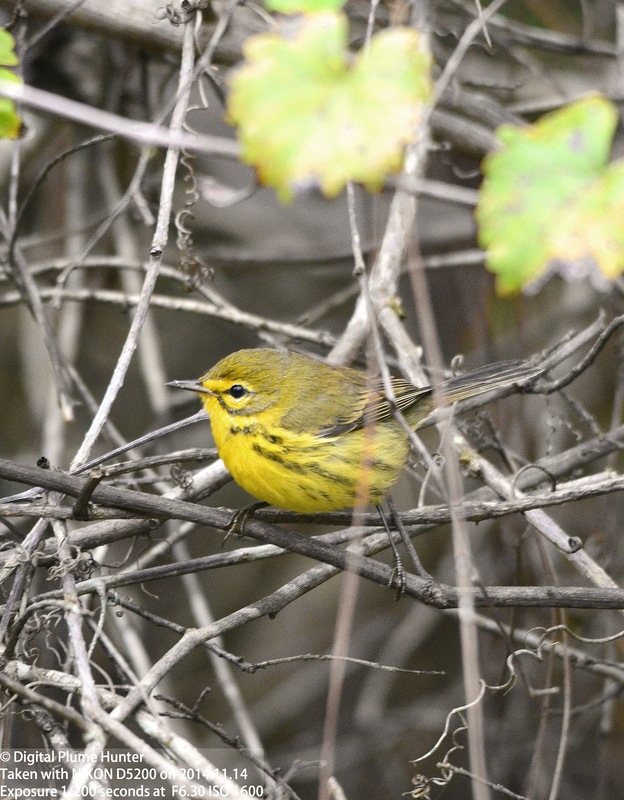 Instantly recognizable in basic or alternate plumage due to its unique facial markings; its eye both eye-lined and prominently circumscribed, the Prairie Warbler is found year round in Southwest Florida. 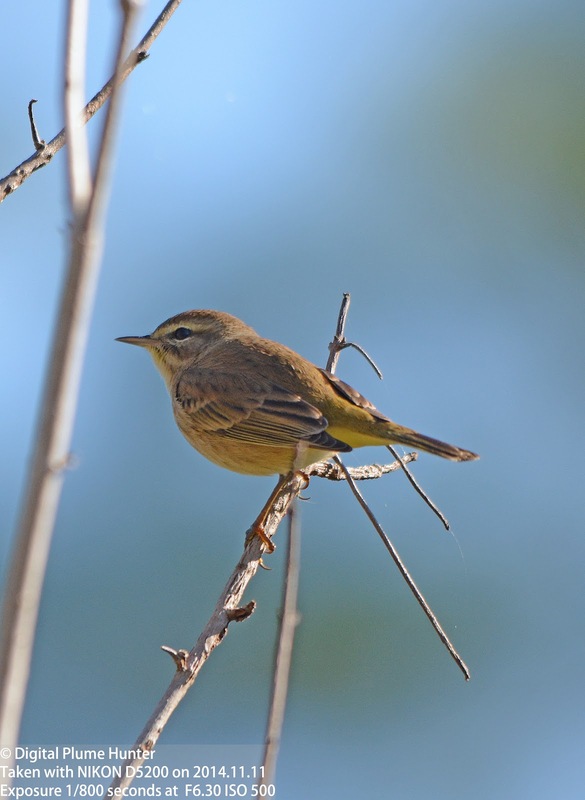 The migratory population (such as this one seen in Michigan) winters largely in the Caribbean unlike the Florida subspecies. 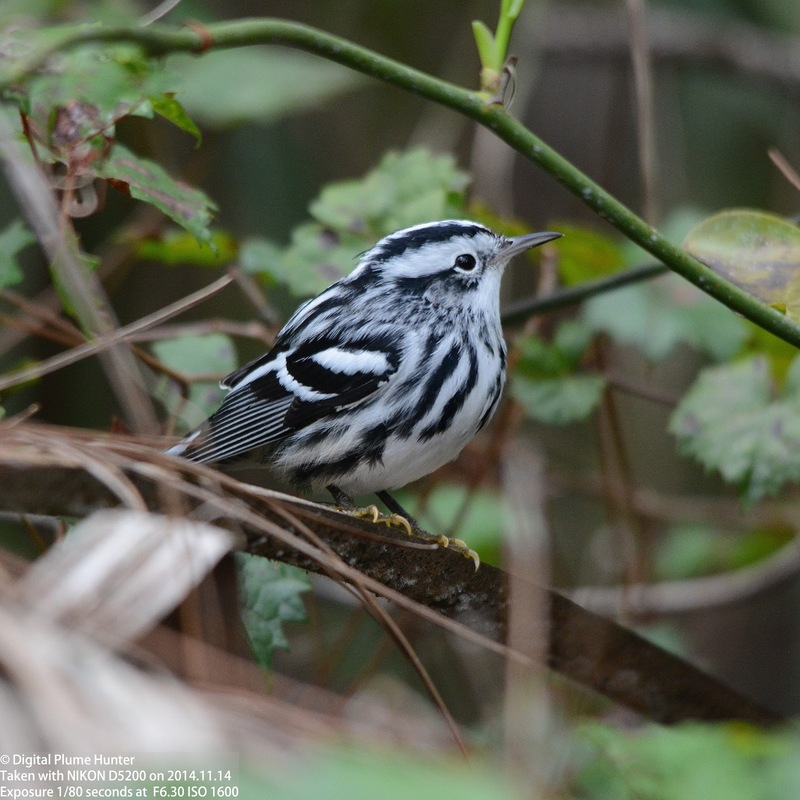 The Black-and-white Warbler, another Eastern warbler, surpasses the Prairie Warbler in both distribution and population by a factor of almost 20 (the global population of Prairie Warbler is about 1.4 million while that of the Black-and-white is about 20 million). 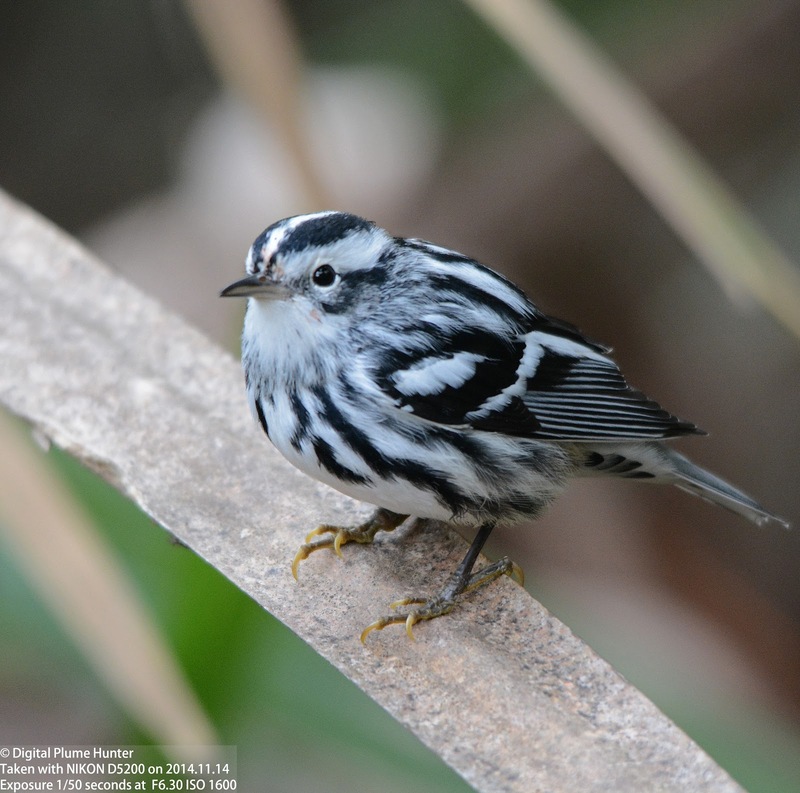 Does the Black-and-white Warbler's zebra-esque plumage serve any functional purpose? 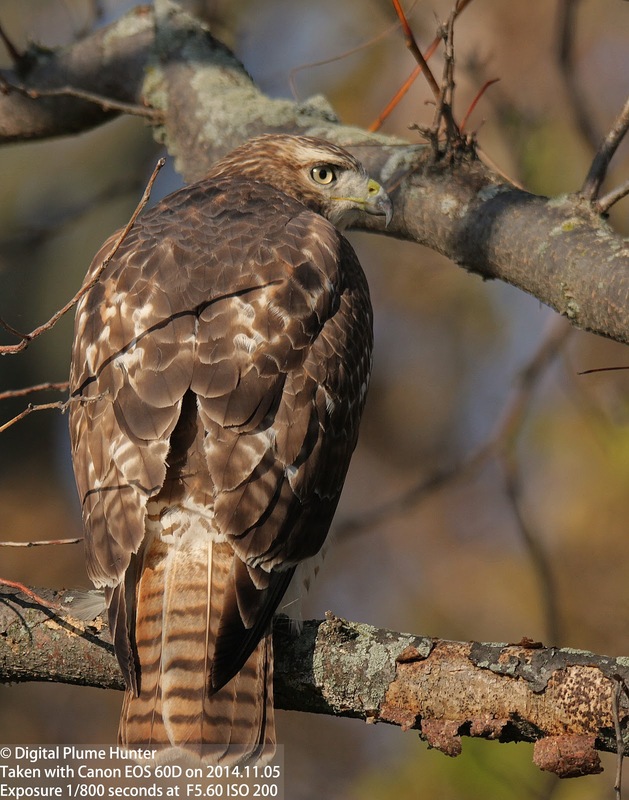 Does it help confuse predators or camouflage it from its prey? 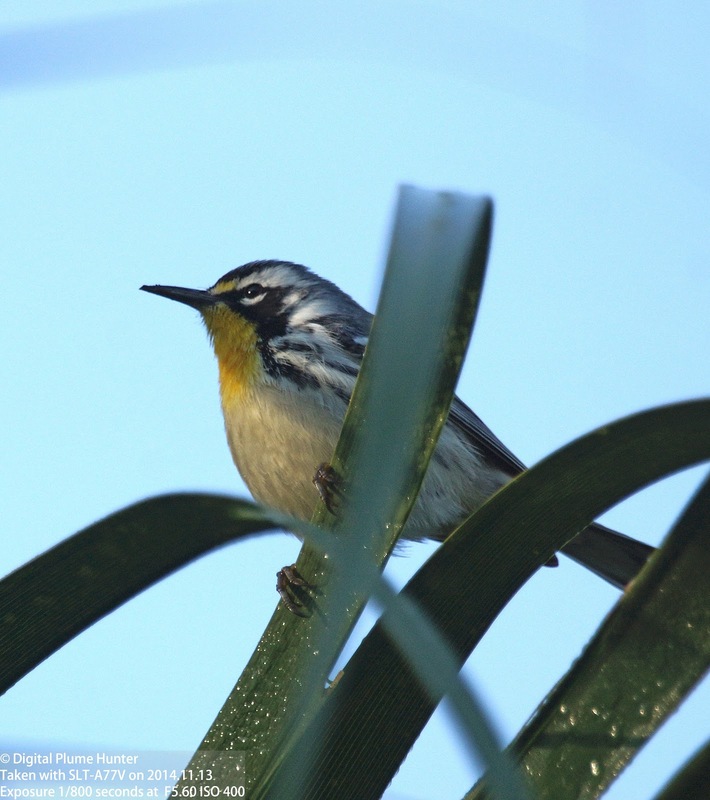 Or is it merely the neotropical breeding strategy of "the most outrageously flamboyant suitor gets the girl?" 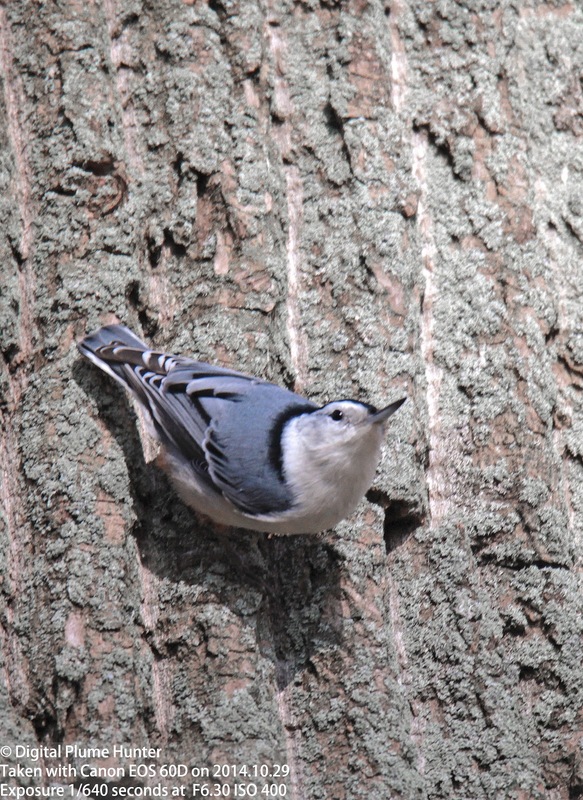 Surely, fascinating topics to explore; what we do know, however, is that the Black-and-white is unique among warblers with its nuthatch-like foraging habits as it creeps hurriedly along tree trunks and tree limbs in search of insects and spiders. 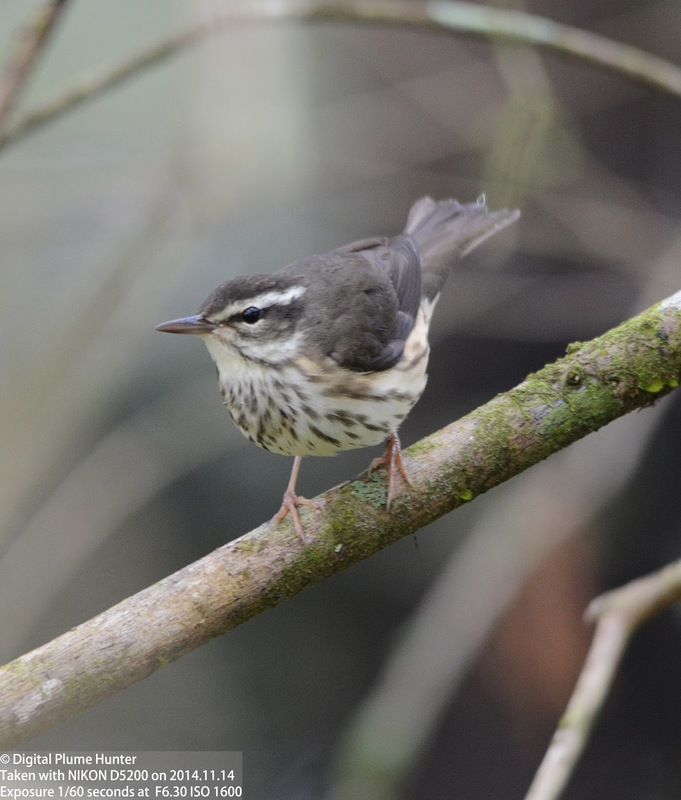 As can be seen from the above images, the Louisiana Waterthrush has a great affinity for water and, while its size is much smaller than that of a thrush, the drab buff-and-pale color scheme is certainly reminiscent of one. 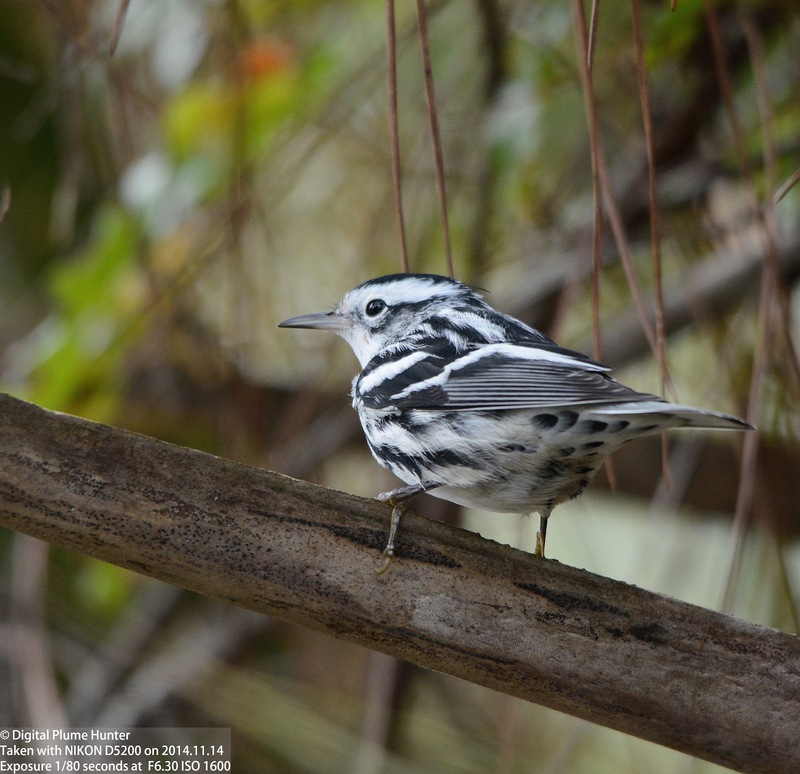 Both Waterthrushes are found at Corkscrew in migration and, when seen together, it results in a situation that inevitably leads to an identification challenge between these two very similar looking, similar sounding and similar foraging Waterthrushes. 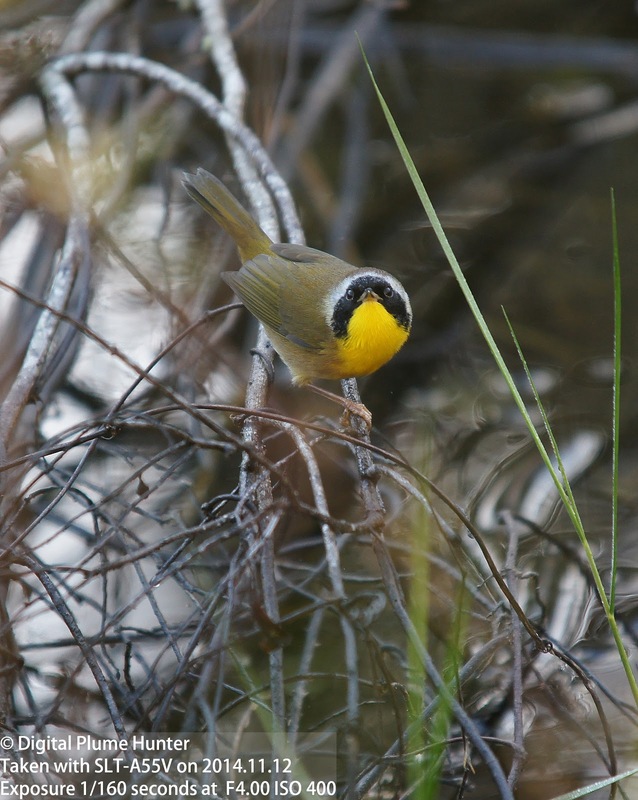 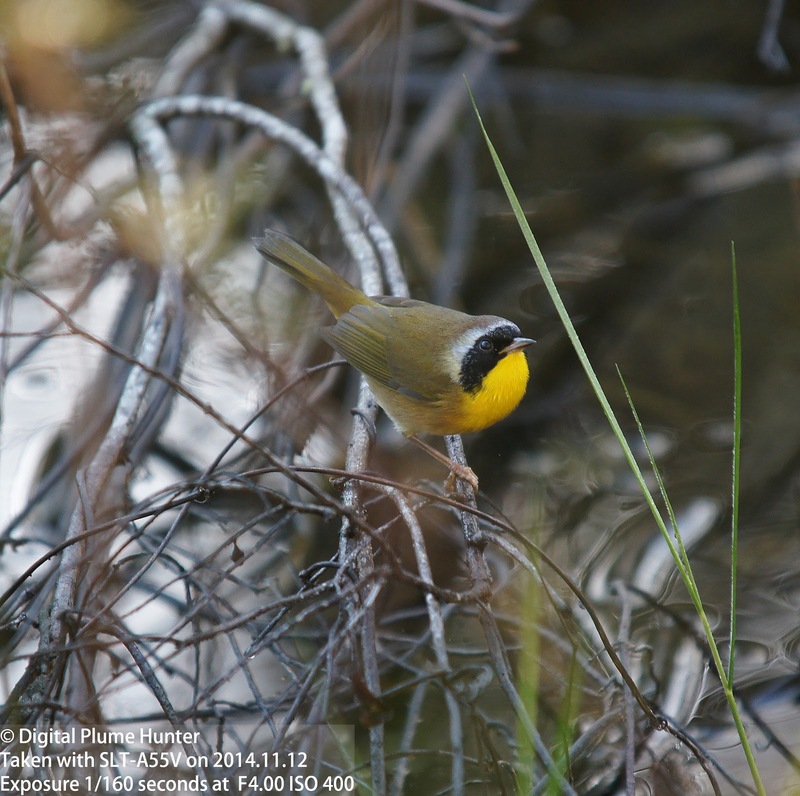 Preferring wet and weedy environments and conspicuous on account of its loud (and harsh sounding) chips, the Common Yellowthroat doesn't look markedly different from its breeding best excepting pinker legs and a lighter green on the back. 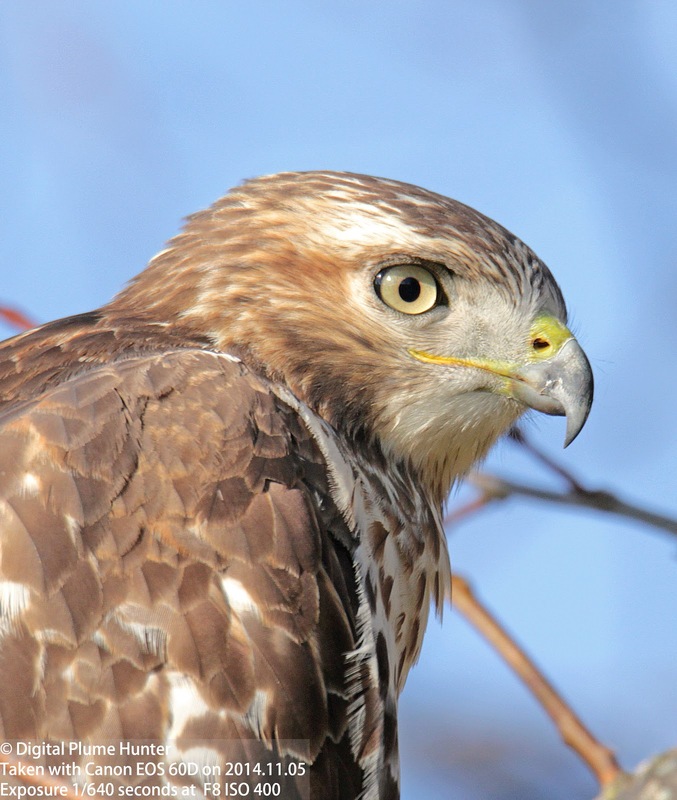 John James Audubon's declared ambition in 1820 was to depict every single species of bird found in North America -- and, in 1825, his dream came to fruition in the publishing of the epic "Birds of America" which detailed 497 species in breathtaking beauty -- a spectacular achievement indeed! 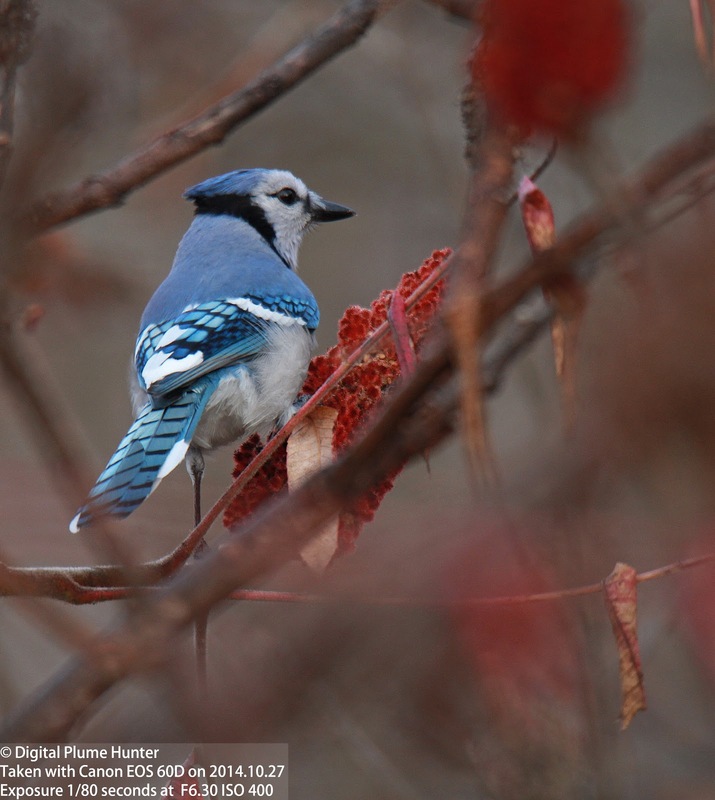 (imagine doing this today without the use of eBird, Birding Guides, and Bird Lines). 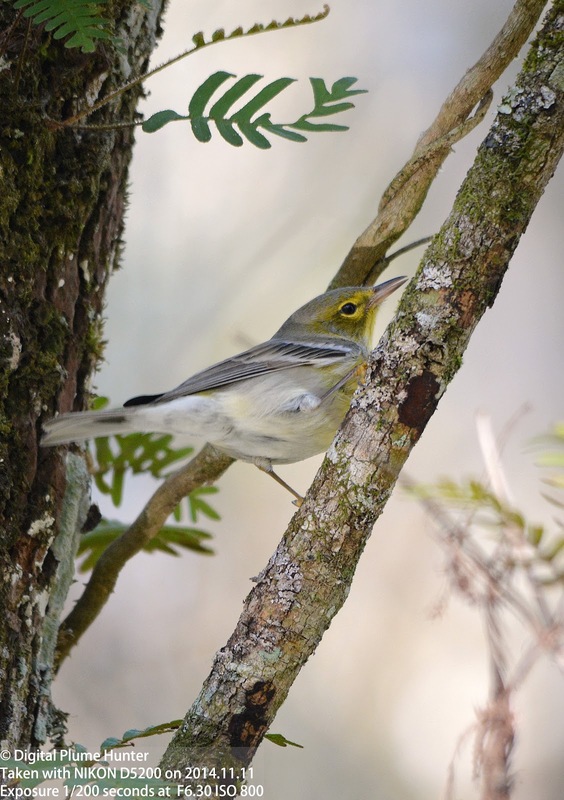 In this, and countless other ways, we can sustain the American traditions of Audubon and Wilson to document, depict and publish our avian observations and therefore contribute, in however small measure, toward the preservation of our birdlife for future generations as so passionately exhorted by Wendell Berry. 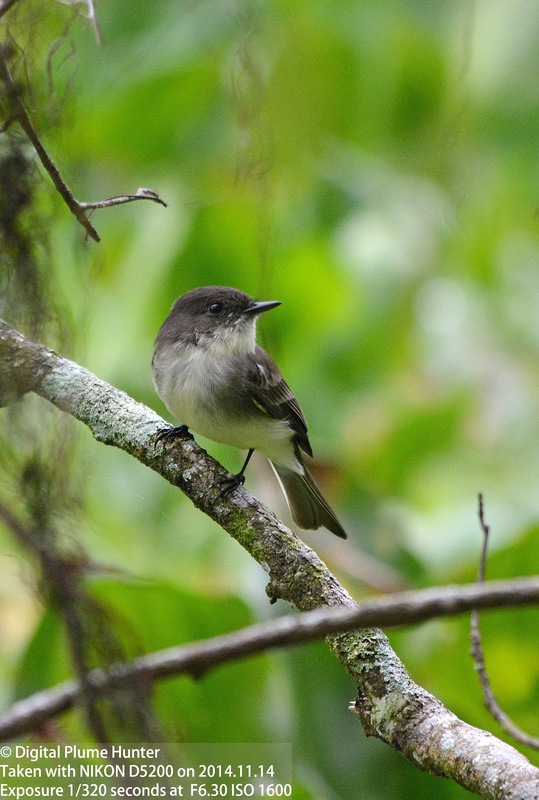 Kenn Kaufman's "Kingbird Highway" is a classic and epitomizes, in many ways, the wanderlust brought on by a birding quest. 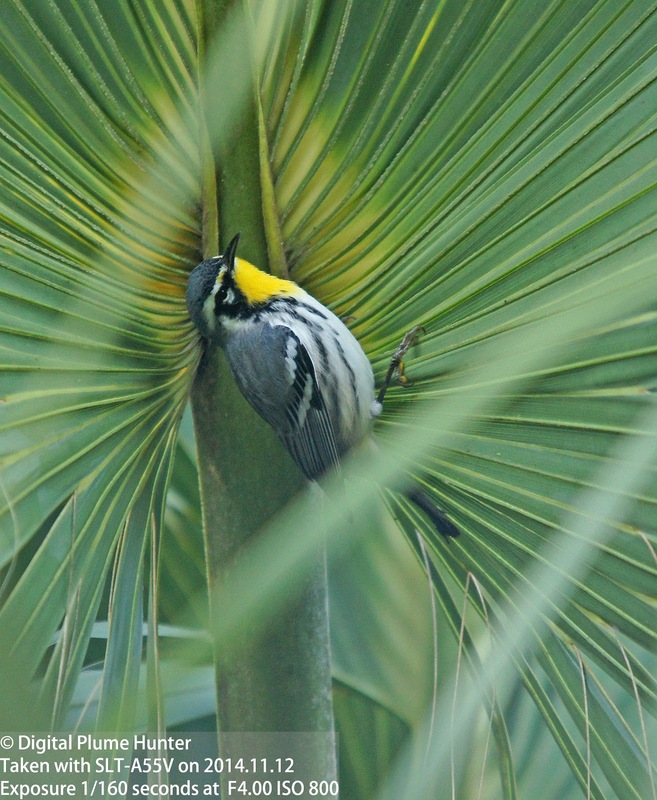 Bob's excellent work at SW Florida Birder is well known and who cannot but enjoy the thrill of the vicarious chase of a rarity or the beauty of SW Florida's birdlife as so passionately captured by Bob. 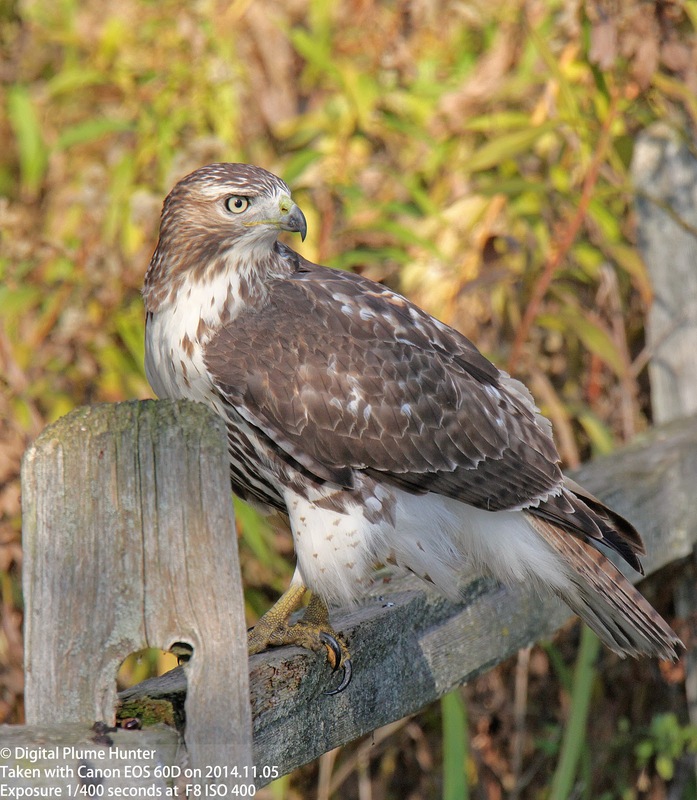 Living in Southwest Florida, one could not be faulted for thinking that the title of commonest hawk in the US belongs to the Red-shouldered Hawk by virtue if its near ubiquity in these parts. 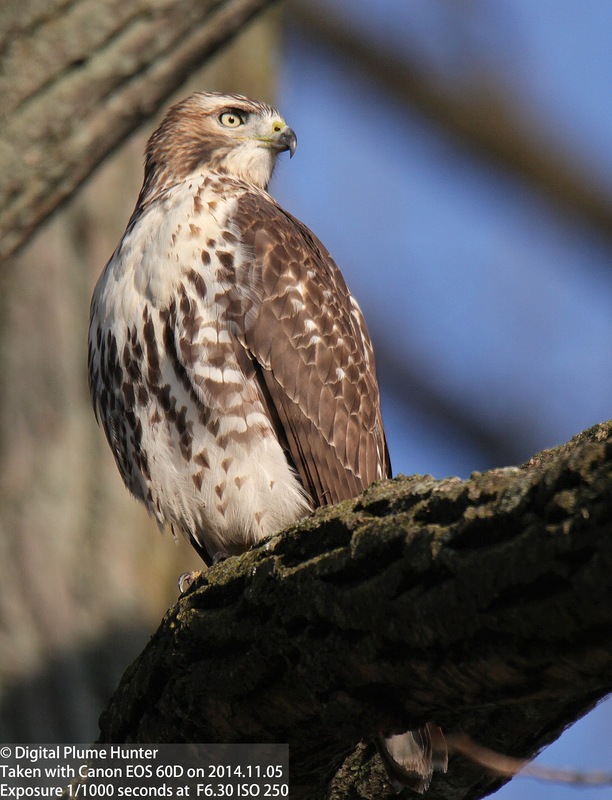 However, this worthy distinction is claimed not by the Red-shouldered Hawk but by the featured Accipter of this post -- the Red-tailed Hawk whose massive range stretches across the whole of the North American continent and is found in every state of the Union (excepting Hawaii). 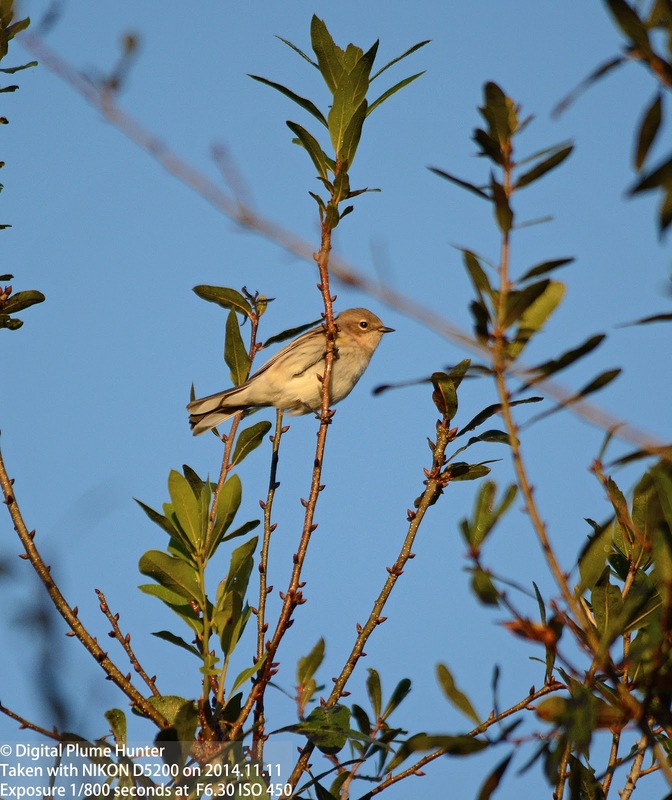 In Southwest Florida, it is a winter visitor to its Red-shouldered cousin. 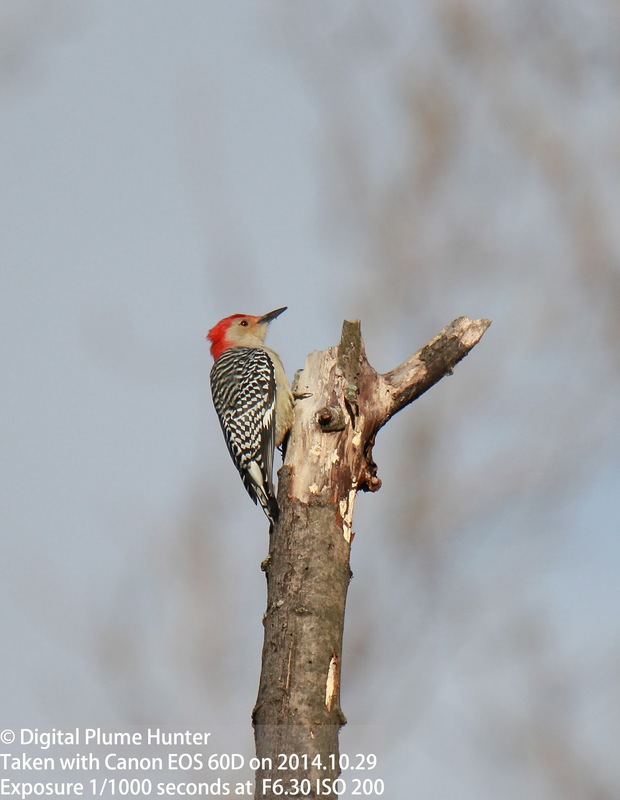 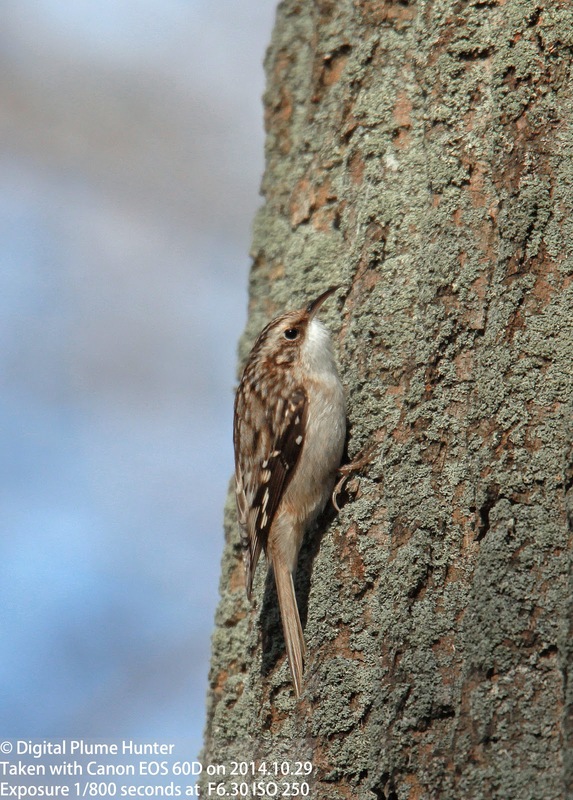 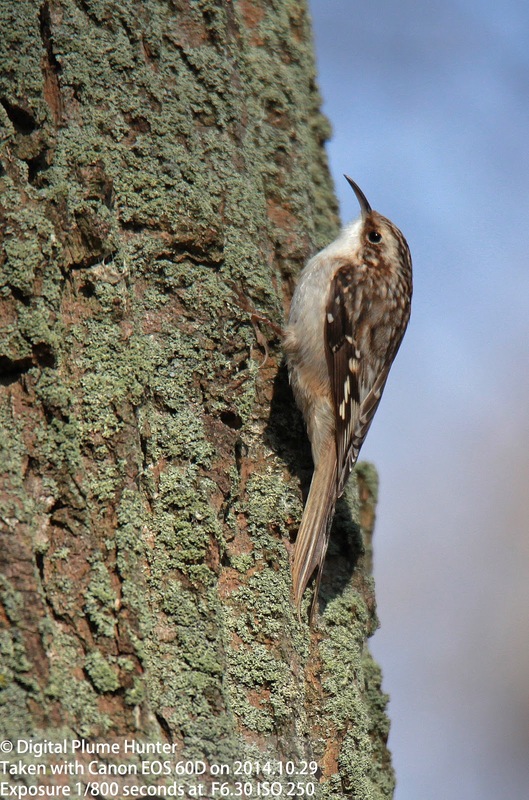 Besides the hawk, we will also review recent sightings of Brown Creeper, Ruby-crowned Kinglet, White-breasted Nuthatch and some common woodland species. 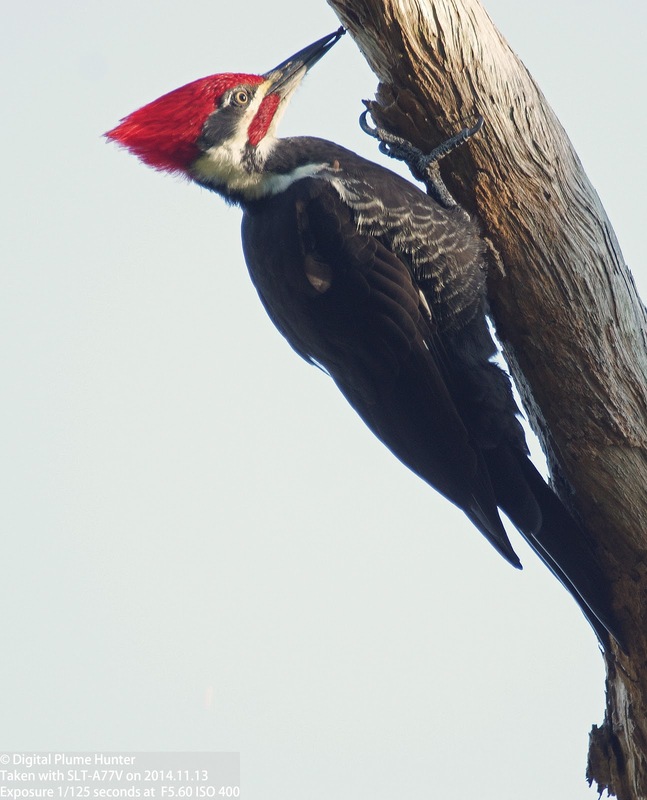 Two sub-adults were sighted; one at Wolcott Mill and the other at Lake St. Clair Metroparks -- their tails not as deeply red as a fully mature adult. 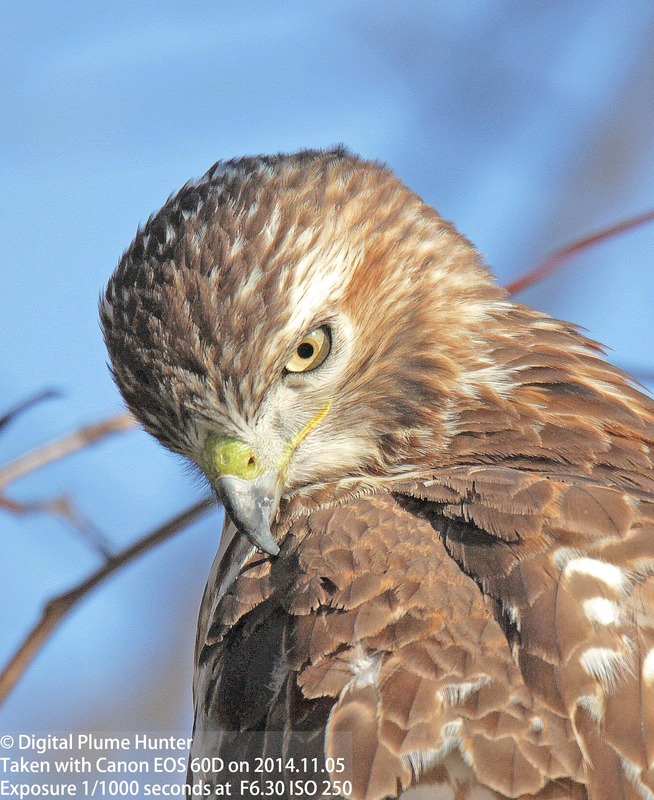 Apart from their trademark red tail, Red-tailed Hawks offer little consistent identification marks owing to a high degree of variability with Pale, Rufous, Dark and Light morphs of the species occurring in the wild. 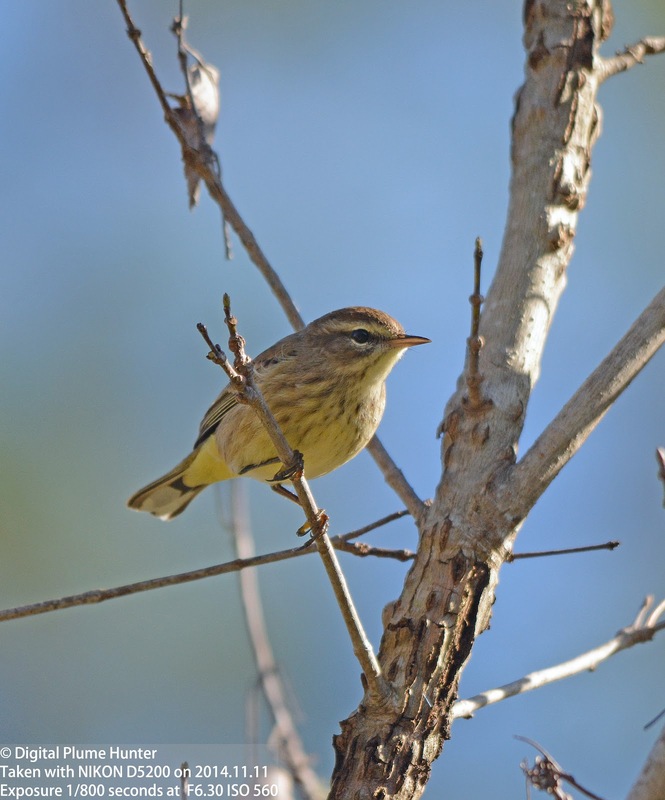 Hence, the best way, in addition to size and shape, is to look for a square tail, yellow eyes and powerful yellow legs (eg., consider these individuals spotted in Arizona and California). 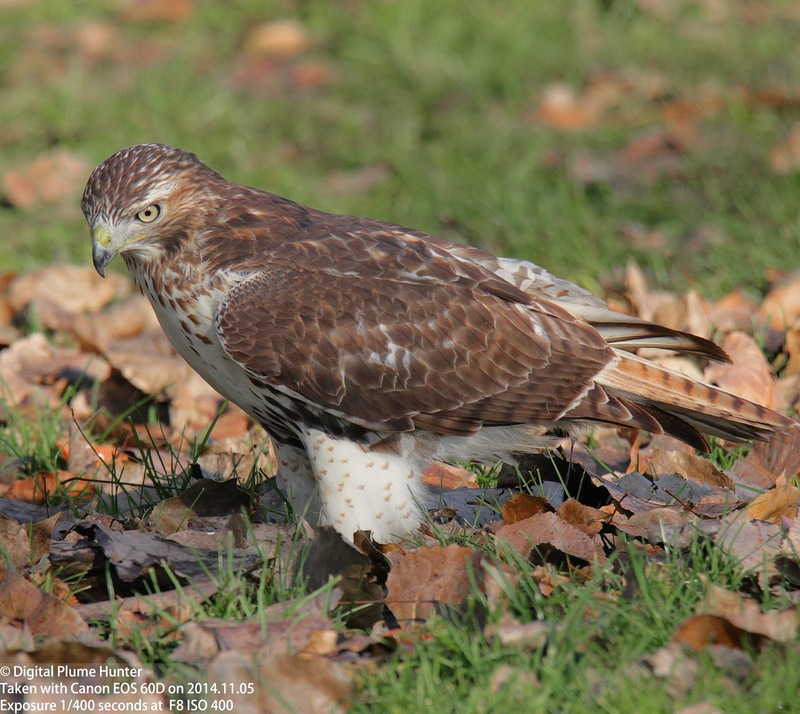 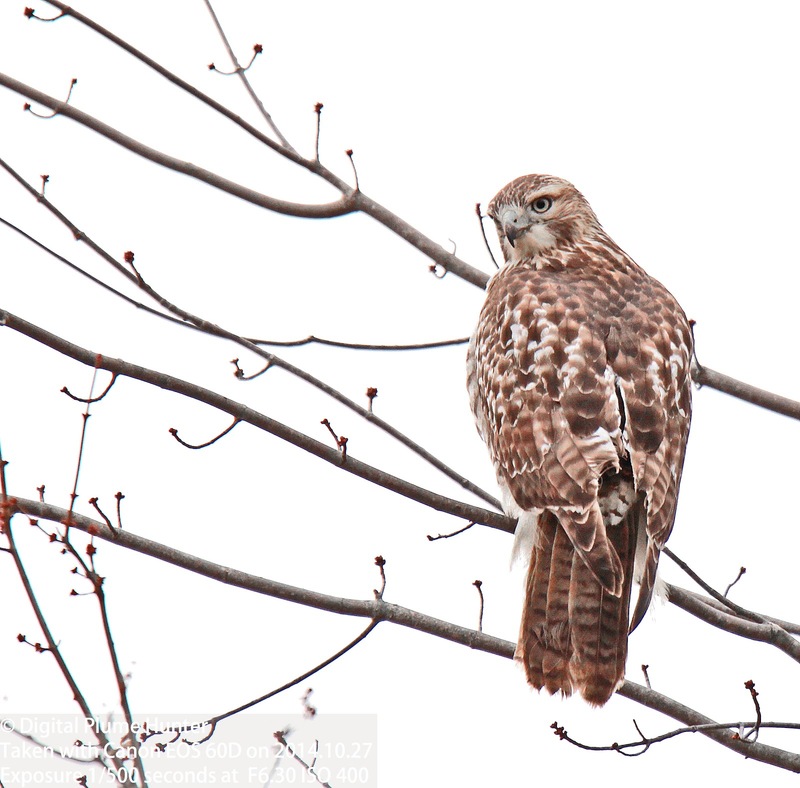 Red-tailed Hawks have a preference for small mammals but birds also figure in their diet. 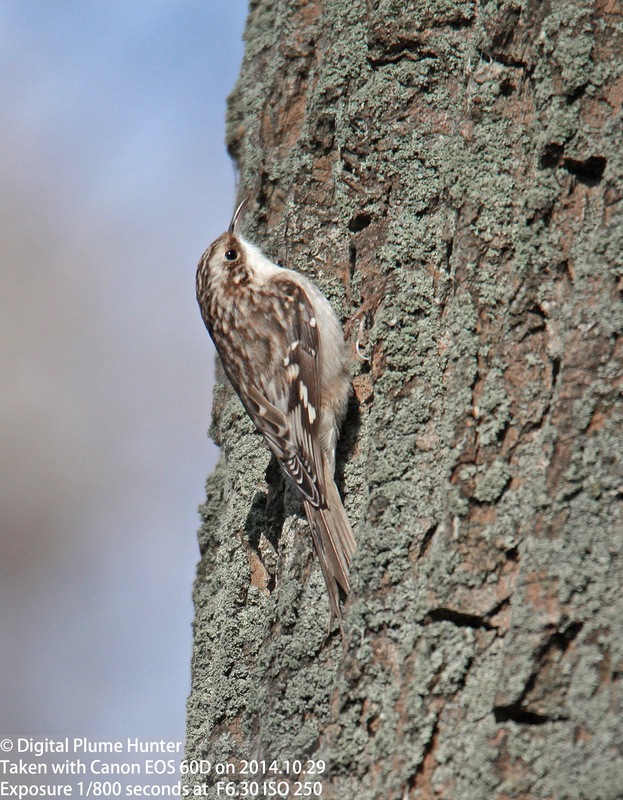 Brown Creepers appear cloaked in invisibility -- their diminutive size, cryptic coloration and fast movements make them difficult to see and (virtually) impossible to photograph. 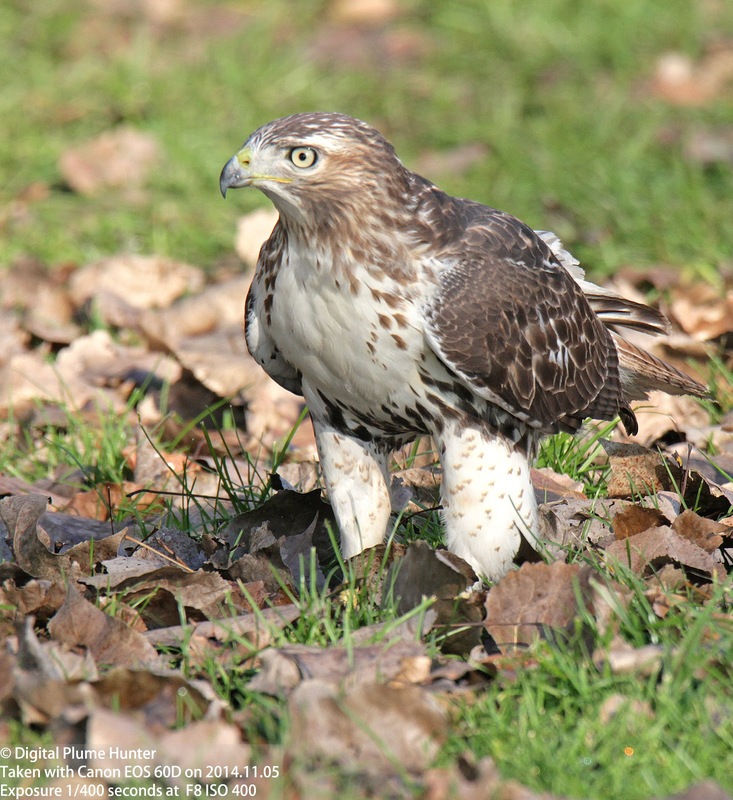 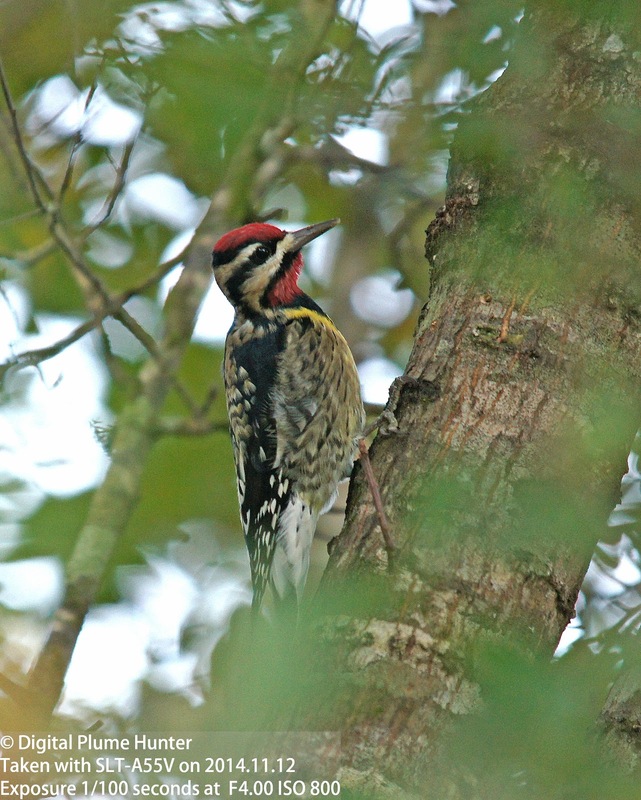 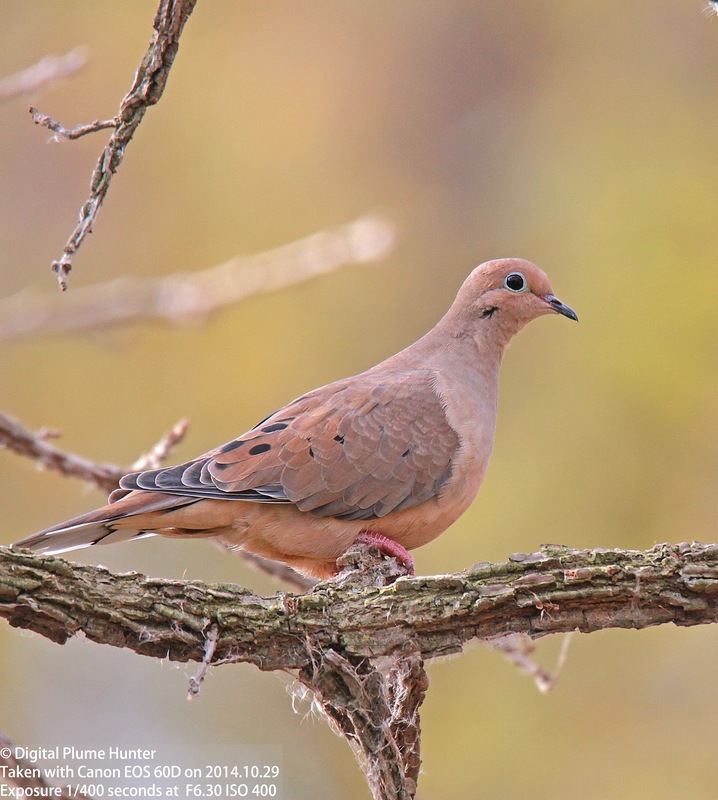 Like the Hawk, the Creeper is found coast to coast in the US and is a year-round resident in its range although some Northern populations do undertake migratory movements. 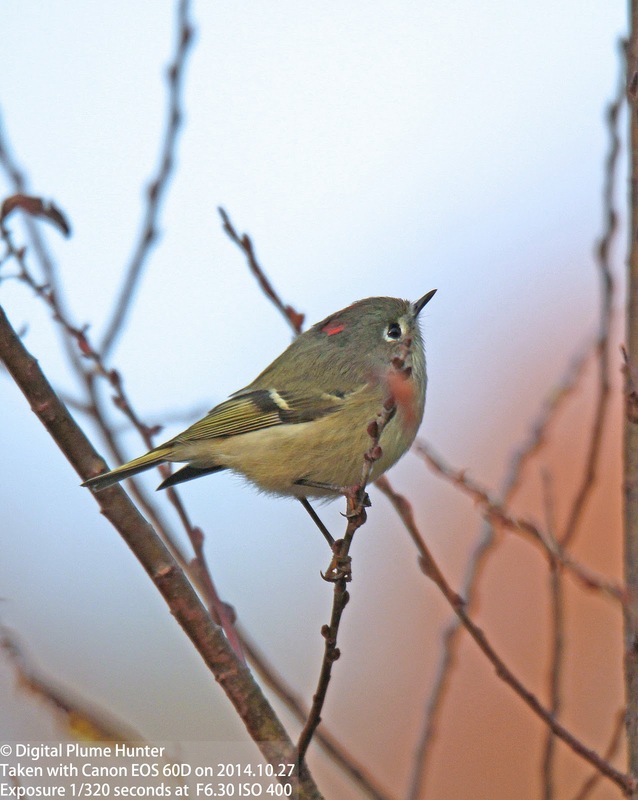 The Ruby-crowned Kinglet, on the other hand, is strongly migratory. 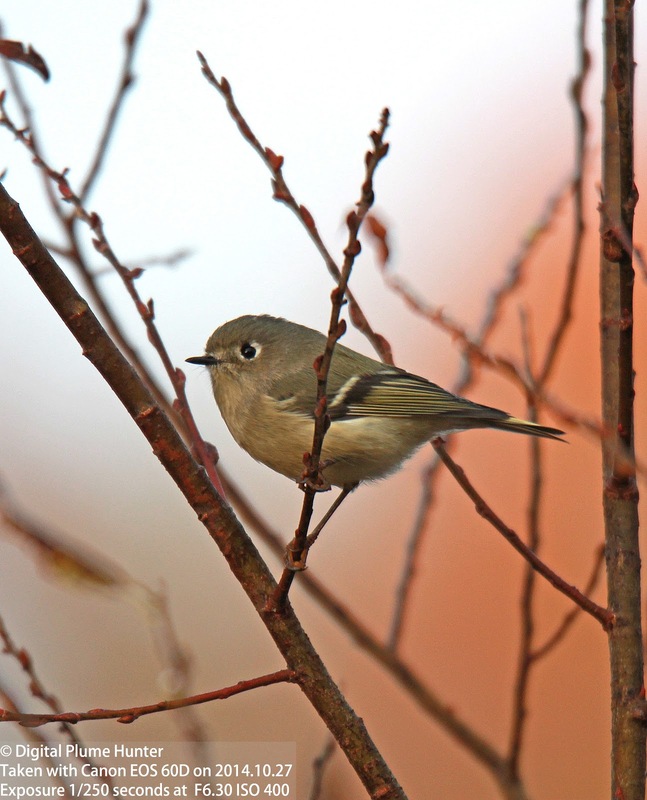 A kinglet is a "small king" and this bird indeed sports a tiny patch of red on its crown -- a feature that, unfortunately, is mostly hidden. 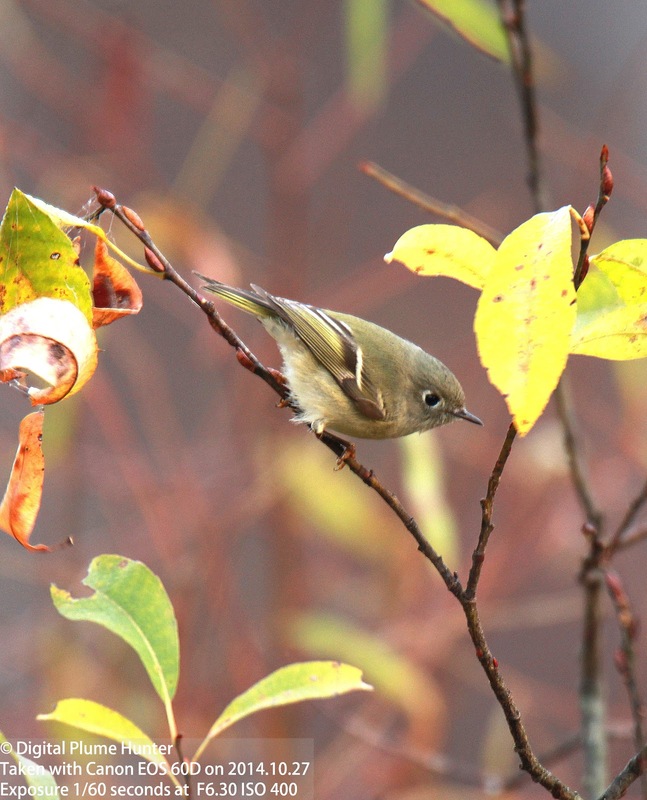 This is one of our two Kinglet species -- identifiable by its small size, neckless body and bold eye-ring. 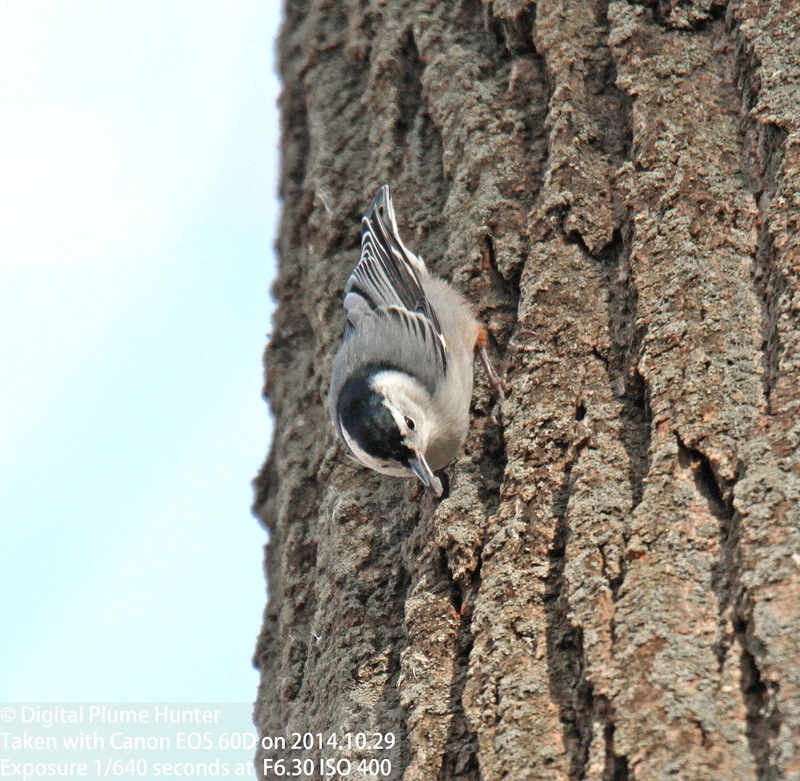 Sharing the Creeper's penchant for vertical climbing, the White-breasted Nuthatch is much more easily seen -- being larger, brighter and noisier. 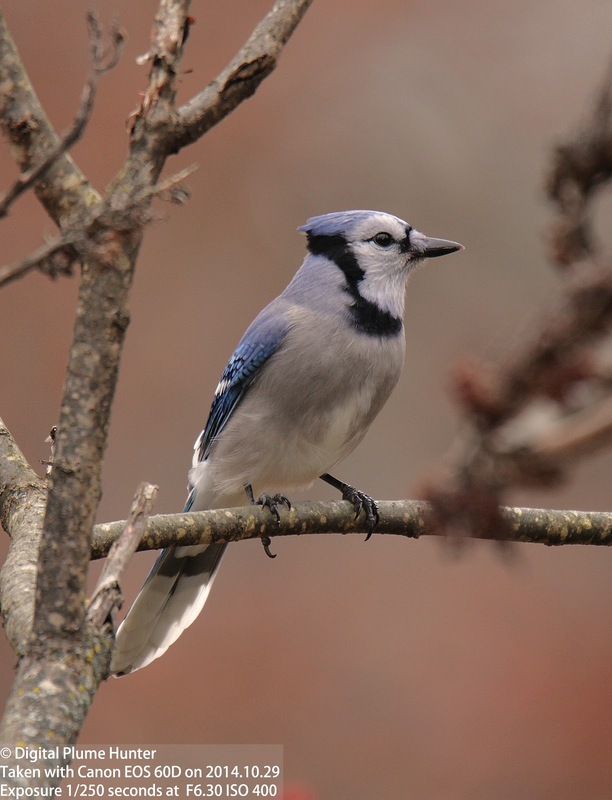 In "Stopping by Woods on a Snowy Evening", the poet extraordinaire Robert Frost wrote -- "The woods are lovely, dark and deep". 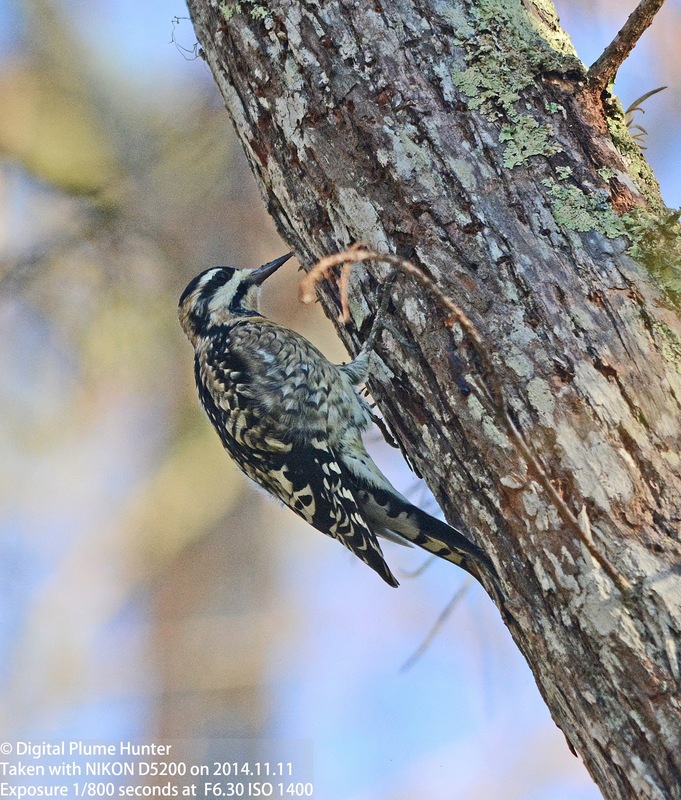 And, for a birder, these words ring true in countless ways -- from the lovely sounds of a nuthatch, the deep red of a kinglet's crown to the dark tail of a hawk -- there is a living avian poem in every habitat in a birder's world as this quick survey of woodland species so aptly attests.